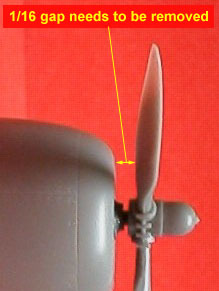 The "engine assembly" sticks too far out of the cowling causing a gap as clearly illustrated in the first photo. The reduction of this gap can be easily accomplished by cutting 1/16 of an inch (1.59 mm) from the engine mounting post provided with the kit. 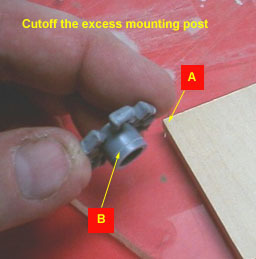 This is pretty easy to do, See photo 2, (A) I used a piece of bass wood with a pin stuck through the corner to make a mark for a cutoff line on the kit part's mounting post.(B). The excess section was carefully removed with a razor saw. You can also rap a piece of 1/16th inch stripping tape around the post as a cutting guide. Shortening this case made it necessary to trim the prop shaft as well. Add pushrods (photo 3) to the front cylinders, this will really enhance their look. AM has made this easy because the part has indentations for pushrods already. 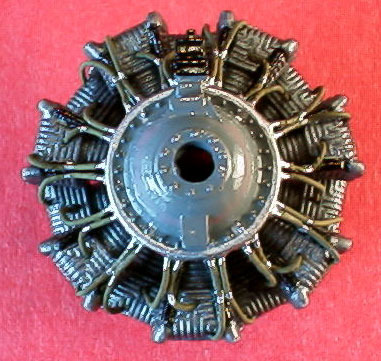 If building the B-25B kit, replace the kit crankcase part (L24) with the a resin replacement from Parts-R-Parts or a copy of the part from the C/D kit. If building the AM B-25C/D kit, cut off the molded on ignition wires/push rods and using a soft wire add ignition wires running from the ignition harness to the cylinder heads. 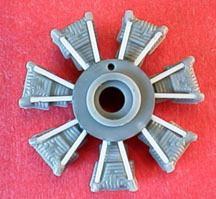 Photo 4 is a finished engine.